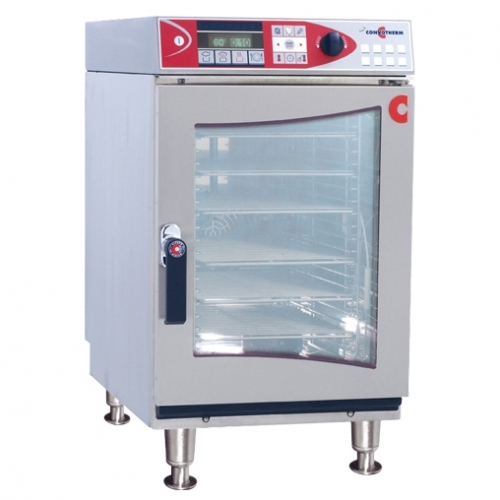 Cleveland Model: OES 10.10 mini Combination Convection Oven / Steamer with simple to operate programmable controls for Hot Air, Convection Steam, and Combination cooking modes, "Cook & Hold" and "Delta T" slow-cooking capabilities, "Advanced Closed System" with "Crisp & Tasty" de-moisturizing feature. Multiple cooking stage programs, stored recipe library, multipoint core temperature probe, "Press & Go", one-step recipe start buttons, "Smart Key" for selecting option settings, boilerless. Capacity for five (5) – 12" x 20" by 2 1/2" steam table pans.